Lost Photos on iPhone after Restore? How to Get Them Back? One way of fixing an iPhone that is irresponsive is restoring it using iTunes. With this method, you should be aware that you would lose data on your iPhone. Recovering photos after restore is not that easy since the photos maybe overwritten thus making it difficult to retrieve them. However, with an iPhone data recovery software, you may increase your chance of getting back the missing photos after restore. In this article, we will walk you through on how you can try to recover photos on an iPhone (iOS 12 included) after restoring it. Photos keep memories alive and losing such precious data on your iPhone that you have saved for so long is stressing. With iMyFone D-Back iPhone data recovery, you can always recover them since this software supports various data loss scenarios. 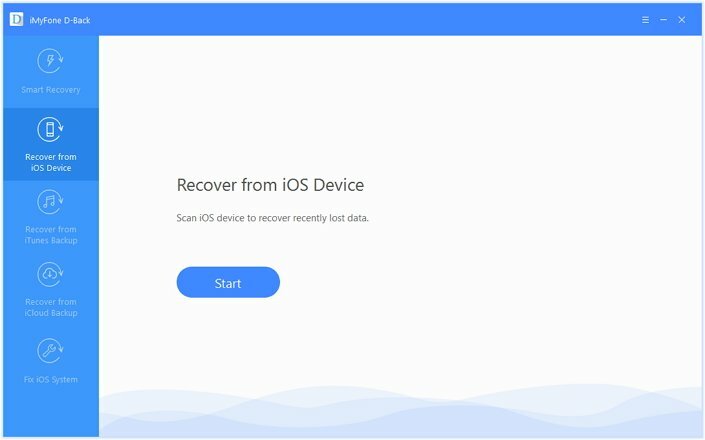 You can restore data that you lost due to deletion, data lost when upgrading to iOS 12, damaged device or even when you incur system crash. Moreover, it comes with an easy to use interface and it very safe. This software is built with other thrilling features as below. It can help you recover photos without restoring. It will not affect your current data on device. 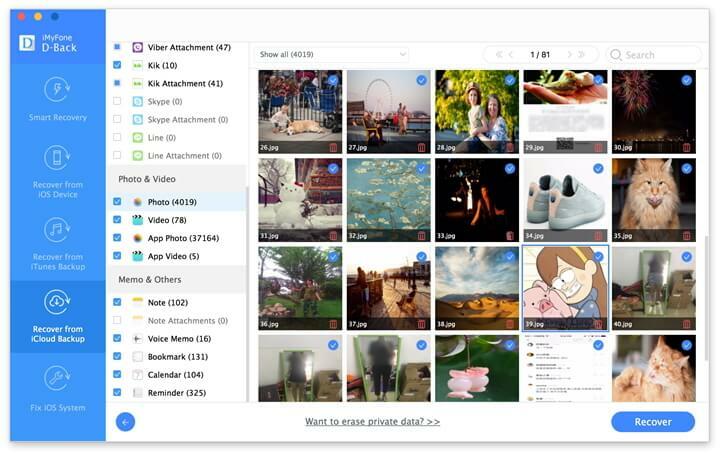 It can selectively recover the photos you need. It can recover 18+ different data types including photos, text messages, contacts, voice memos, videos, WeChat Messages, Kik Messages and WhatsApp history among others. It supplies free trial version deeply scan iPhone after restoring, iTunes backup and iCloud backup to find your photos with utmost probability. 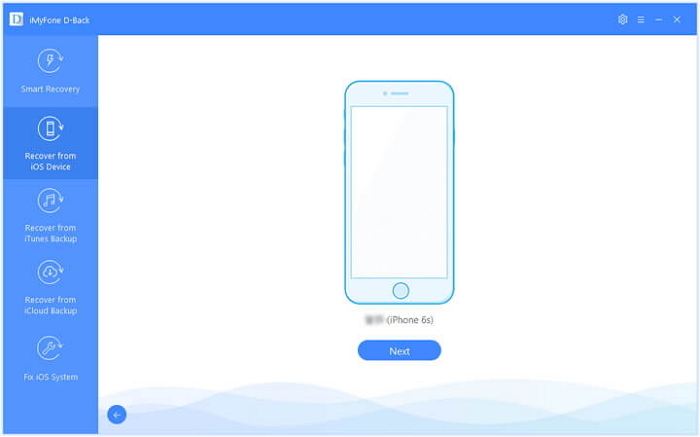 It supports all iOS devices and iOS versions including the latest iPhone XR, iPhone XS, iPhone XS Max, iPhone X, iPhone 8 with iOS 12.1/12/11/11.4/11.2. It is built with Fix iOS system feature that allows fixes and repairs iOS devices that are stuck in recovery mode, black screen and white screen of dead. Now let us look at 3 ways in which you can recover data using this software. Step 1.Run iMyFone D-Back on your computer and then select Recover from iOS Device. Click Start to begin. Step 2.Connect the iPhone to the computer using USB cables and click Next as soon as the program detects the device. Step 3.In the next screen, select Photo under Photo & Video since it is what we wish to recover. Step 4.Once the scan is complete. 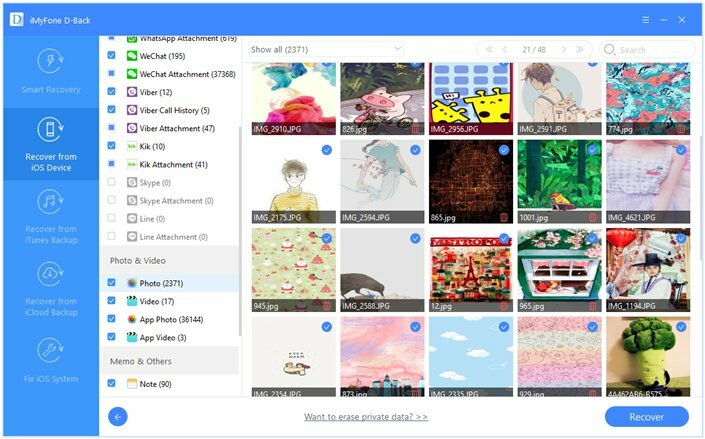 Preview the photos and then select the ones you want to recover. Click Recover to save the deleted photos. To be able to restore photos from iTunes backup, you should have done a backup of files before. Step 1.Choose "Recover from iTunes backup"
Open the program once you have installed it on your computer. 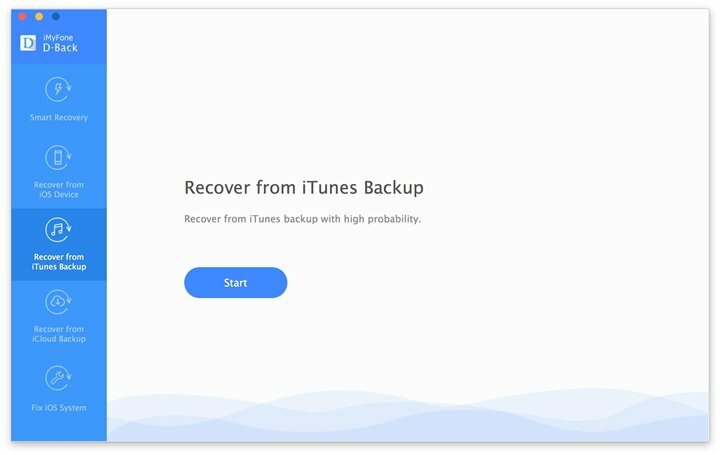 On the left hand side click on Recover from iTunes Backup option. Now click on the Start icon. You will then have to select an iTunes Backup file and click "Next". After that you will be able to select the file types that you want to restore. Mark on Photo and App Photos and click on Next button. Once the scanned files they will be displayed on the window. Click on Photos tab and preview each photo that has been restored. Next, mark on those that you want to save back to your iPhone and click on Recover button. 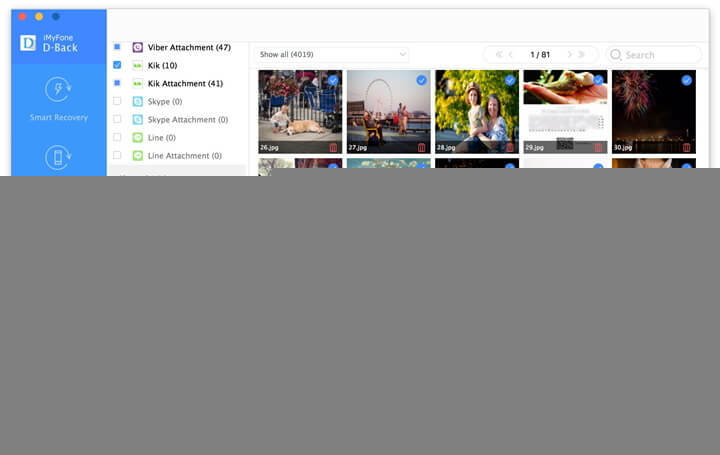 Complete the process by saving the photos on your computer. 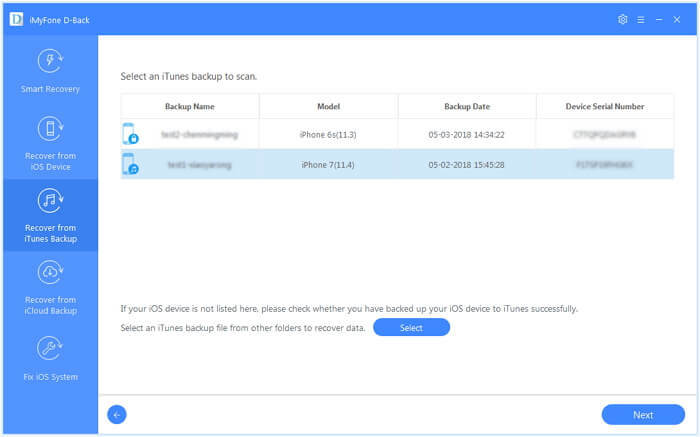 This method requires that you have done a backup of Photos on your iCloud account. Step 1.Choose "Recover from iCloud backup"
Launch the program and click on "Recover from iCloud Backup". The software will then let you click log in to your account. This software is safe and secure so don't be sceptical on logging in. 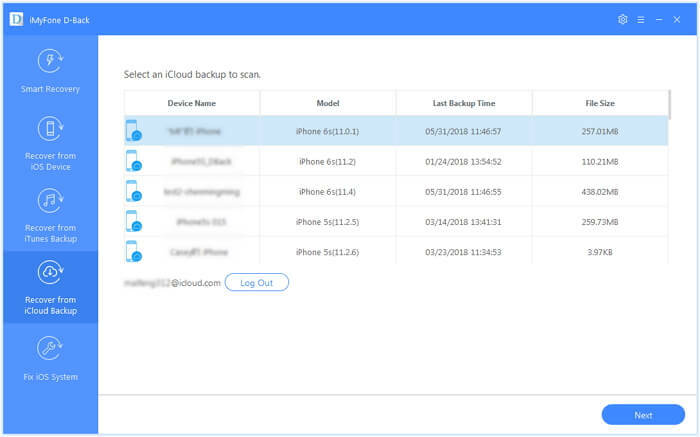 Once you are logged in you will see all your iCloud data backups. Click on the one you want to scan and click on Next button. Now, select the file types to restore which is the photos and click Scan icon. After that, the program will download and analyze the data in the iCloud backup. On the program screen you will see all the lost files that have been recovered. Under Photo & Video category is where you can find your photos. Click it and have a preview of the photos that can be recovered. After that, you can now tick on the ones that you want to download to your computer and then click on Recover button at the lower right. If iCloud Photos has been turned on, then your photos will be stored in iCloud Photos; if you haven’t turned it on, iCloud Backup may include photos and videos in your Photos or Camera Roll. If you cannot find the photos in your iCloud backup, you need check whether iCloud Photos is turned off when you made the backup. So after you restore your device, check Settings > [your name] >iCloud > Photos. Lastly, choose the location and the name of the files that you have recovered. 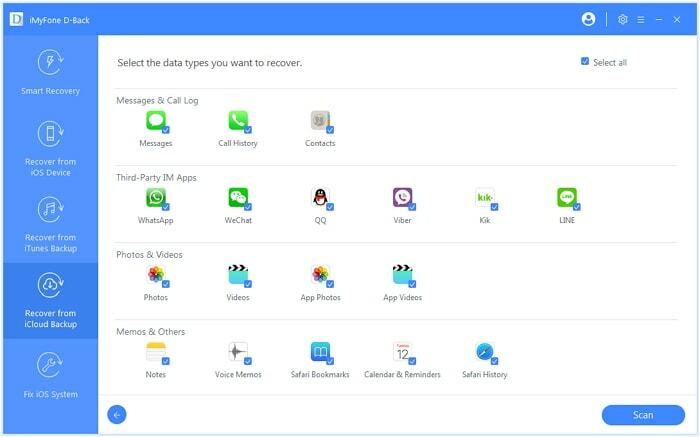 With the free trial version of iMyFone D-Back iPhone data recovery software (iOS 12 supported), you can preview all the recoverable photos in the preview interface.